The main concern in face-processing research is to understand the processes underlying the identification of faces. In the study reported here, we addressed this issue by examining whether local or global information supports face identification. We developed a new methodology called “iHybrid.” This technique combines two famous identities in a gaze-contingent paradigm, which simultaneously provides local, foveated information from one face and global, complementary information from a second face. Behavioral face-identification performance and eye-tracking data showed that the visual system identified faces on the basis of either local or global information depending on the location of the observer’s first fixation. In some cases, a given observer even identified the same face using local information on one trial and global information on another trial. A validation in natural viewing conditions confirmed our findings. These results clearly demonstrate that face identification is not rooted in a single, or even preferred, information-gathering strategy. Figure - Procedure used to create iHybrid faces. 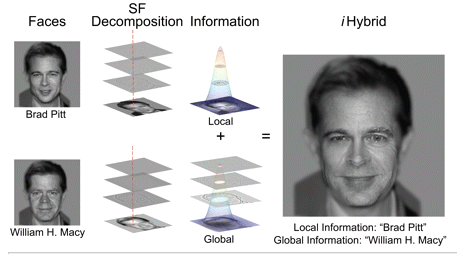 The spatial frequencies (SFs) of two original face images (illustrated here with Brad Pitt and William H. Macy) were decomposed separately into four nonoverlapping SF bands of 1 octave each (<3, 3–6, 6–12, >12 cycles per degree of visual angle). A Gaussian window (SD = 25 pixels, ~1° of visual angle) was then centered on every potential fixation location on each face; this procedure formed a lattice of 5- × 5-pixel cells covering the original 260 × 260 image. When an observer fixated on the stimulus, the local information across the four SF bands for one identity was extracted through the Gaussian window at that location, and the complementary global SF information was extracted from the other identity. The sum of the complementary, fixation-dependent identities formed the iHybrid stimulus. In the example illustrated here, the dashed red line indicates a fixation location at the left eye; local SF information was extracted from this location in the image of Brad Pitt, and the complementary SF information was taken from the image of William H. Macy. An observer who identifies the resulting face as Brad Pitt is using local information, and an observer who identifies this face as William H. Macy is using global information.